“Woman-Ochre” was stolen from the University of Arizona Museum of Art in 1985. It was discovered in 2017 by a Silver City, N.M., antiques dealer after an estate sale. This is a Dec. 6, 1985, sketch of the suspects in the theft of the Willem de Kooning painting from the University of Arizona Museum of Art. Though the work of art has apparently been recovered and is back on campus, the FBI’s investigation into the theft is ongoing. The painting was discovered a few months ago in a house that was being sold in Silver City, New Mexico. An empty frame still holds narrow edges of the Willem de Kooning painting, which was cut out of the frame during the 1985 theft. Ruth Seawolf had millions in her hands and let it slip away. It started with a phone call the Silver City, New Mexico, real estate agent received a few months back. The gentleman on the other end said his aunt — her name has not been disclosed — had died and he wanted to sell her house. But first, it was loaded down with her possessions. The first thing she noticed when she opened the door was the artwork. “There were hundreds of paintings in the home,” said Seawolf. One of the paintings she picked up and looked at was “Woman-Ochre,” a Willem de Kooning piece stolen from the University of Arizona Museum of Art in 1985. The museum won’t say what its worth is, but it was valued at $400,000 when it was stolen, and when the UA tried to revive interest on the theft’s 30th anniversary, a news release said the piece was worth up to $160 million. A little more than a decade ago, another de Kooning painting in the “Woman” series sold for $137.5 million. Seawolf did not know that, of course. And she wasn’t interested in taking the piece by one of the giants in the 20th century abstract expressionism movement. She connected the seller to David Van Auker, owner of Silver City’s Manzanita Ridge Furniture and Antiques, who arranged to purchase some of the home’s contents. Among those was the de Kooning oil. And the painting began its journey back to where it belonged. “It really is thanks to a good citizen, David,” said Meg Hagyard, the interim director of the UA Museum of Art. A few people pointed out to Van Auker that the painting looked like an original, so he began to research the piece, coming across articles about the theft. By Thursday, Aug. 3, he was pretty sure he had the real deal and called the UA museum. It didn’t waste any time. Hagyard and a few other museum employees were in Silver City the following Monday. And they were inclined to agree with him: This was the de Kooning that was stolen the day after Thanksgiving 1985. There is restoration that needs to be done on the painting, as well. Hagyard said they do not know yet when they will be able to put the piece back on display. Artist Josh Goldberg remembers well the morning the art was stolen. He was the museum’s director of education. He had the day off, but the mother of a young student called. She had an art project. Could he help? Goldberg arranged to meet the two before the museum opened. As he walked up to the main entrance, he noticed a man and woman sitting on the bench, waiting for the doors to open to the public. “I looked over at them and I thought there was something odd about them,” Goldberg recalled. After he helped the student, he stepped into the washroom before he left. “It’s gone, the painting’s gone,” said the panicked guard. They both ran out the front entrance, the guard going one way, Goldberg the other. But it was too late; they, and the de Kooning, were gone. “It was a sickening feeling,” he said about looking at the place where the painting once was, sloppily cut away from the frame. Lee Karpisack, the curator of the museum at the time, recalls how devastating the theft was. UA Chief of Police Brian Seastone was a corporal with the campus police at the time, and was assigned to the case. “It was a Friday morning right after the museum opened up,” he recalled. Campus police called the FBI for help, but with no clues to go on, it seemed pretty hopeless. The investigation into the theft continues, and the FBI declined an interview request. That morning was an emotional one for the staff, Seastone recalled. Monday, when the piece returned to the museum, there were tears again, he said. “A lot of tears of happiness and joy. I felt the same emotion. It was so wonderful to have this home where it should be,” Seastone said. The recovered painting by Willem de Kooning is readied for examination by UA Museum of Art staff Nathan Saxton (r), Exhibitions Specialist, and Kristen Schmidt, Registrar, on Aug. 8, 2017. David Van Auker, a furniture and antiques dealer in Silver City, New Mexico, can’t hold back his excitement when telling the story of discovering a missing Willem de Kooning painting. Olivia Miller, UA Museum of Art curator, looks on. Willem de Kooning’s “Woman-Ochre” was found in New Mexico after being stolen in 1985 from the University of Arizona Museum of Art. Willem de Kooning’s “Woman-Ochre,” on display for a news conference on Monday, has been returned to the University of Arizona Museum of Art. 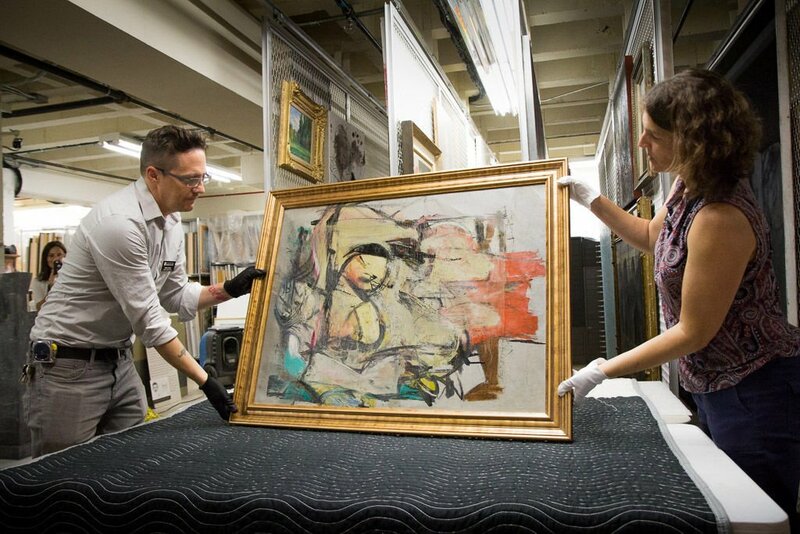 This undated image provided by University of Arizona Museum of Art shows an oil canvas by artist Willem De Kooning, titled: "Woman-Ochre," 1954-55, a Gift of Edward Joseph Gallagher, Jr." The artwork was stolen 30 years ago from the University of Arizona Museum of Art in Tucson, Ariz.
A Dec. 6, 1985 sketch of the suspects in the theft of a Willem de Kooning painting from the University of Arizona Museum of Art. 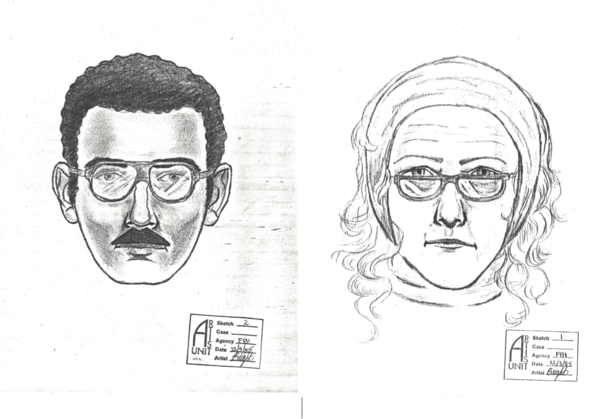 They were described as a woman in her mid-50s with shoulder-length reddish-blond hair, wearing tan bell-bottom slacks, a scarf on her head and a red coat, and a man with olive-colored skin, wearing a blue coat. Both had thick-framed glasses. Today, the empty frame still holds narrow edges of the missing de Kooning painting at the University of Arizona Museum of Art in Tucson. Diversification, building audiences and embracing Arizona artists are among David Ivers' goals.